The National Research Foundation and Swiss National Science Foundation through their Swiss-South Africa programme, have funded a project entitled: A context-based knowledge resource integrating HIV and Mtb molecular biology with host-pathogen and drug-resistance data. 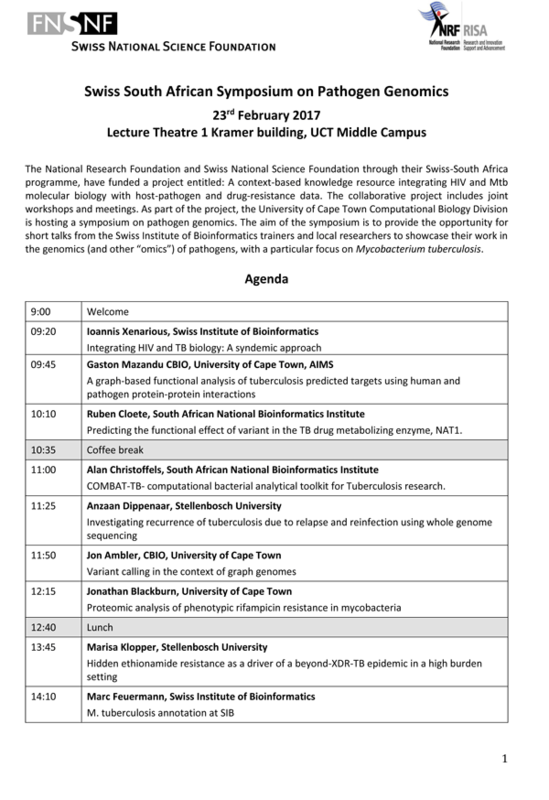 As part of the project, the University of Cape Town Computational Biology Division and our research group at UKZN are hosting a symposium on pathogen genomics. The aim of the symposium is to provide the opportunity for short talks from the Swiss Institute of Bioinformatics trainers and local researchers to showcase their work in the genomics (and other 'omics') of pathogens, with a particular focus on Mycobacterium tuberculosis.